According to the CDC, 47.2% of adults age 30 or older have some form of gum disease. That equates to approximately 64.7 million adults that have mild, moderate, or severe gum disease. If left untreated, mild or moderate cases can progress to severe periodontitis and the gums will begin to pull away from the teeth. Over time, bone loss may occur and the teeth may fall out. The CDC is working with the American Academy of Periodontology and the American Dental Association to increase public awareness regarding gum disease. Bacteria in the mouth that gets into the gums is what causes gum disease. As bacteria sits on the teeth, it forms a film that is known as plague. If plague is not effectively removed from the teeth, it hardens into tartar and begins to spread below the gum line. After tartar has formed and begun to spread below the gum line, it is necessary to have professional assistance to remove the substance from the teeth. Many patients are unaware that they have gum disease, so it is important to understand the symptoms. Bad breath, swollen gums, sensitive teeth, and bleeding gums are all early symptoms that often go unchecked due to the minor nature of these signs. More alarming symptoms include painful chewing, loose teeth, changes in bite, and receding gums. Unfortunately, these symptoms often become noticeable in more advanced stages, when professional intervention is needed. Certain factors make patients more susceptible to gum disease. Smoking, poor oral hygiene, and poor stress management can increase the likelihood of developing gum disease. Heredity, crooked teeth, immune deficiencies, diabetes, and hormonal changes can also increase vulnerability. Poorly fitting bridges and defective fillings may make it difficult to clean the teeth properly, which can allow bacteria to build up. Advanced age also increases risks; about 70% of adults over 65 have periodontitis. Flossing, brushing, and having professional cleanings done regularly can help to prevent gum disease from developing. If risk factors are present, seeing a periodontist periodically may help to prevent gum disease or may help to catch it in early stages when treatment is not as difficult. 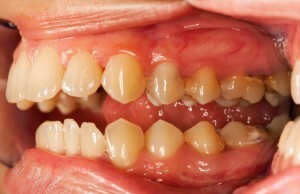 If gum disease does develop, a periodontist may be able to effectively treat the disease using scaling and root planning techniques or laser therapy. Medications or corrective surgery may also help to treat the disease.